Vidushini, these stoles look gorgeous. Do you sell them also? Can i have your direct contact number. I am looking for a mithila paintings artists in Bangalore. Greetings to you. Your work is so exquisite n beautifu. As a Indian i'm proud that you are promoting this art from Bihar. I have a shop"Josh Gallery" in Pune,Maharastra. We promote all kind of Indian Art Products. We also promote various products made by NGO'S of our country. I'll be privileged to buy dupatta's from you. Do let me know if they are for sale? How much they cost? If possible give me your contact number so that i can speak to you for this purpose. Hope to have a long and fruitful business relation with you. So colourful and beautiful dupatta. Its breathtaking work. Please show more of your work. 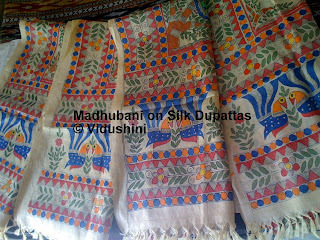 I am looking for madhubani painted dupattas, so just wanted to know wether do you sell them. Can i have your contact detail. I am very happy to see your work in Bangalore...this is the power of MITHILANCHAL & MITHILA PAINTING. power of MITHILANCHAL & MITHILA PAINTING. I am very ti see your painting work in bangalore. I am proud to see your work. I am from Bihar Madhubani DIst. and doing mithila painting in bangalore. Plese contact me lkp.india@gmail.com. Your work is very beautiful and unique. Please send me your direct number. lovd ur work..looking for madhubani cotton dupattas in mumbai.plz if u could guide me.